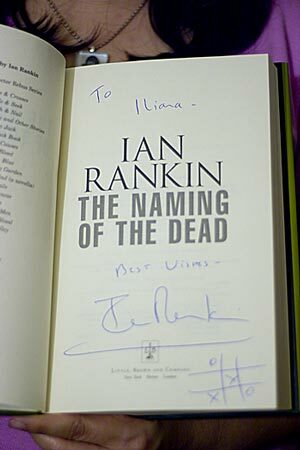 I just got home from going to the Ian Rankin book signing at one of local Borders. What fun that was although at first I wasn’t so sure it was going to be a good experience. The podium and 40-some chairs they set up for the reading was only a few steps away from another event, a live broadcast for some radio station. Hello? Who thought this was going to work. Luckily the radio folks packed up their gear and left pretty soon after the talk started. Ian Rankin talked about his latest book, The Naming of the Dead, which has Inspector John Rebus tracking the murderer of a recently released criminal. Meanwhile, most of the other officers are trying to provide security for the G8 Summit. Oh wow, does this mean Rebus might get to meet George W. Bush and give him a piece of his mind? The author also talked a bit about what it’s been like to write for the past 20 years the Rebus character. The next book he is working on is actually the ‘retirement’ book but he said he still has a lot of options for Rebus. He could “stop the clock” and just not let him age as he’s been doing since the series started, or he could have him retire and come back to provide assistance on special cases. Either way, I’m thinking Rebus still has a lot of work left to do. At least I hope so. Well, Ian Rankin sounds like he’s a busy guy too. Aside from working on the next Rebus novel he’s also got a novella about an art heist set in Edingburgh and will be serialized in the New York Times starting on May 3rd. He is also working on a comic book for DC Comics and a libretto for a Scottish opera. Here’s my signed book! For any of you who like police procedurals I highly recommend this series. Fun!!!! Glad you had a good time. And my ears perked up when you said comic book! How brilliant! I must give Rankin a go, but well done on meeting him and getting your book signed. What was the noughts and crosses in the corner?! What fun! I keep meaning to start his series but still haven’t gotten around to it. I really should! Oh, that sounds like fun! I love meedting authors and getting books signed. How cool!!! I’m definately going to have to add him to my bookshelf. Glad you had a good time. What fun! I love going to hear authors speak and meeting them. It makes reading their work seem so much more personal. Andi – Ha! He said which series he was going to do but I can’t remember now. Lazy Cow – You are a Rebus fan aren’t you? How far along are you in the series? a.book.in.the.life – He was drawing different things in people’s books. But I would imagine that this refers to his first book in the series, Knots & Crosses. Tanabata – Hope you do give his books a try. aka Nik – It was so fun. I can imagine for some authors it must be a drag to go on book signings (well it probably is for all of them) but he was so funny and seemed to be having a good time. Tara – I totally agree! He sounds like a neat guy. Love the little tic-tac puzzle he added. Very clever. Guess I’ll be adding this series to my list, but DARN I wish there weren’t so many. Looks like you had a great time. I remember you recommending Ian Rankin before. I’ve added him to my list. With 16 Inspector Rebus novels, I’ve got a long way to go. Nice! I am not sure if I have read any of his books. Mental note to check the library shelves. Should I read them in order. I always like to start at the beginning. booklogged – Yep, he’s written a lot. I’m still so behind. Gavin – Good to hear you’ll giveh is books a try. Nancy – I’m picky and I have to read in order but I do think you could get away with these and not read them in order. Better than Law and Order? Very cool Chica and another one to add to your collection! He is such a popular writer in the UK and there was always at least one copy of his novel on everyone’s shelf it seems. Perhaps I need to give him a try!